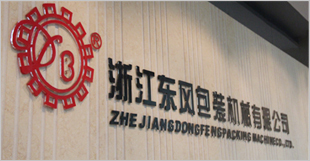 COMPANY PROFILE Zhejiang dongfeng packing machine co .,ltd dare the members of CCCME , Zhejiang science and technology type enterprises,Wenzhou AAA certificated enterprises, Lucheng focus enterprise and export based. Zhejiang dongfeng packing machine co .,ltd dare the members of CCCME , Zhejiang science and technology type enterprises,Wenzhou AAA certificated enterprises, Lucheng focus enterprise and export based. Factory occupying an area of 16800 square meters,more than 40 engineers and technicians. Annual production capacity 100000 sets ,90% of which for export ,almost of the products have CE certifications. We are proud of biggest packaging machinery industry in china .